An exclusive location such as the San Biagio, with its architecture and its location, is ideally suited for special occasions (weddings and receptions) or as a venue for conventions and business meetings. Our halls, rooms and our staff are on hand to make sure that everything runs smoothly, from every point of view. The former palazzi of the nobility are amongst the most desirable of settings when it comes to weddings and receptions. The San Biagio not only provides its exclusive areas, such as the courtyards, living rooms and the breakfast room, for the different parts of the ceremony (welcoming guests with an aperitif, the dinner/lunch, the cake cutting, etc.) but also, on request, it can take organize the whole event. Once the details have been agreed with the couple, the hotel will contact the necessary individuals (photographer, musicians, hair stylist, make-up artist, etc.) so that all you need to do is enjoy the most important day in your life. 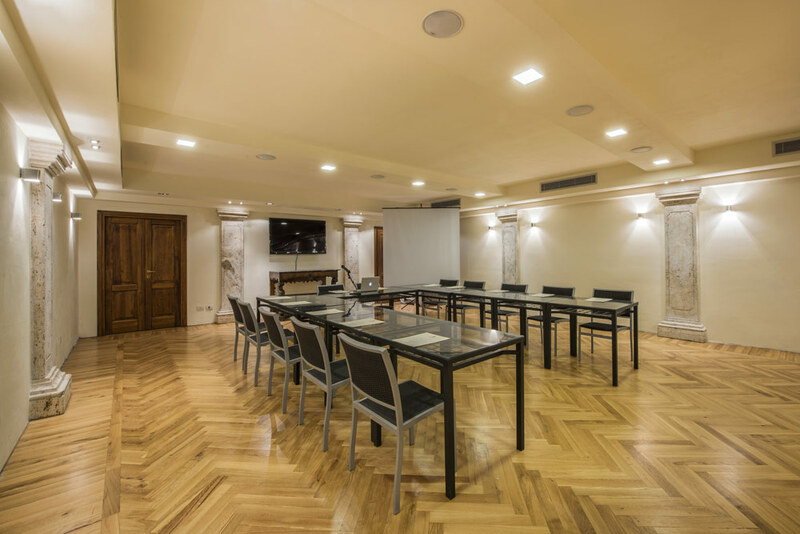 The Caravaggio Room of the San Biagio is designed for meetings and conferences and can be customized according to the individual needs of the participants. You can have 80 seats arranged in theatre style, 42 in classroom style or 33 in a horseshoe. All the necessary equipment is also present, like projector, microphones, flipchart, wi-fi. 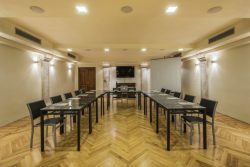 This includes the use of the meeting room for half a day with the basic set up (a central table for the speakers, a 52″ LED TV with DVD player, a flipchart, chairs and a Wi-Fi connection. It also includes a coffee break and a three course working lunch. The cost is 63€ per person for a minimum of 15 participants. This includes the use of the meeting room for a full day with the basic set up (a central table for the speakers, a 52″ LED TV with DVD player, a flipchart, chairs and a Wi-Fi connection. It also includes two coffee breaks and a three course working lunch. The cost is 84€ per person for a minimum of 15 participants.